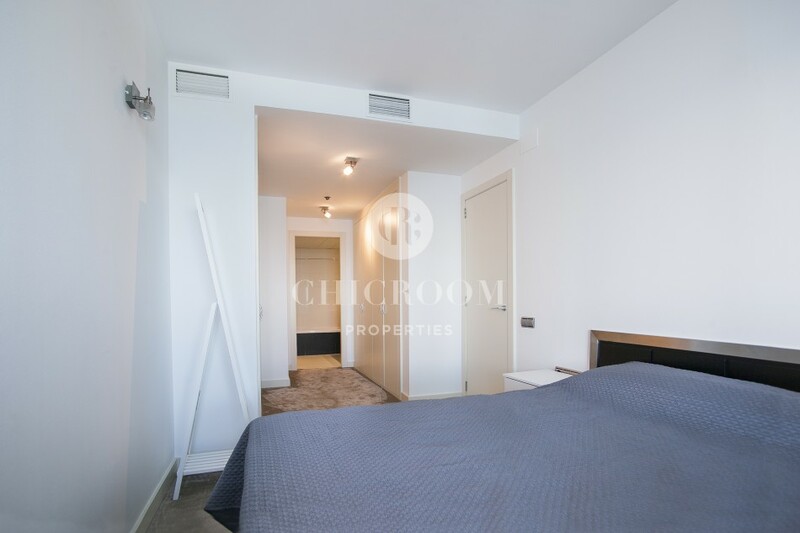 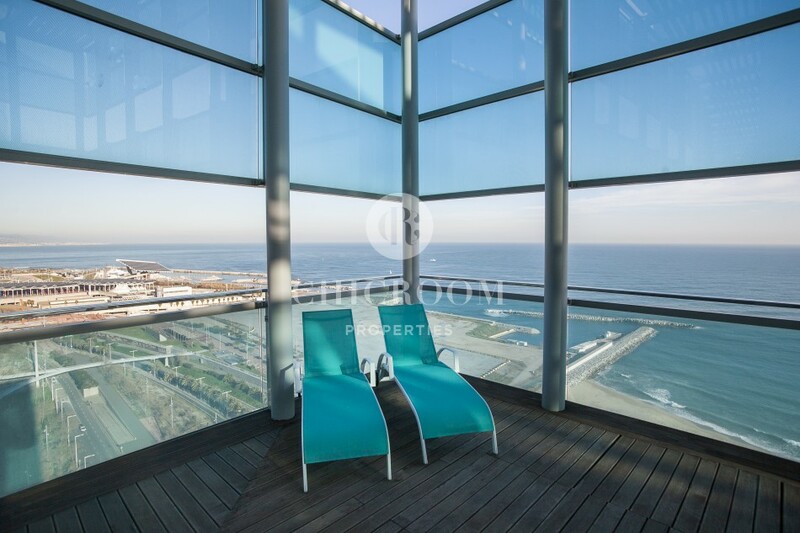 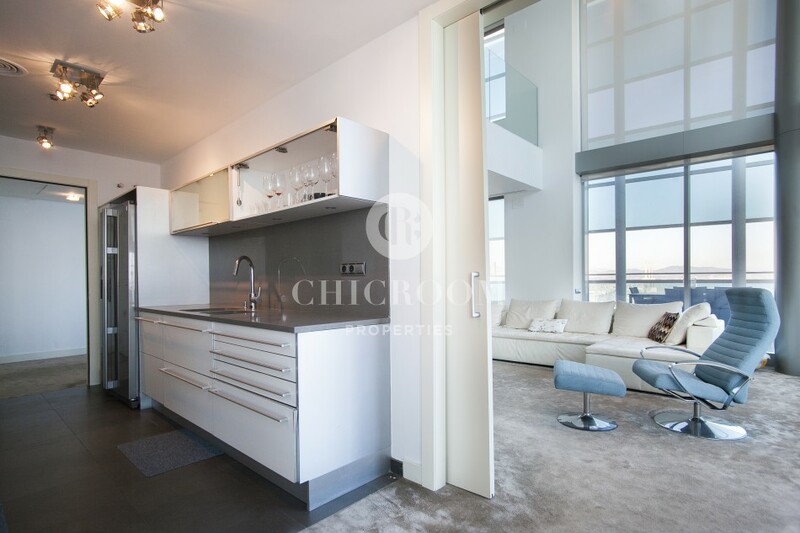 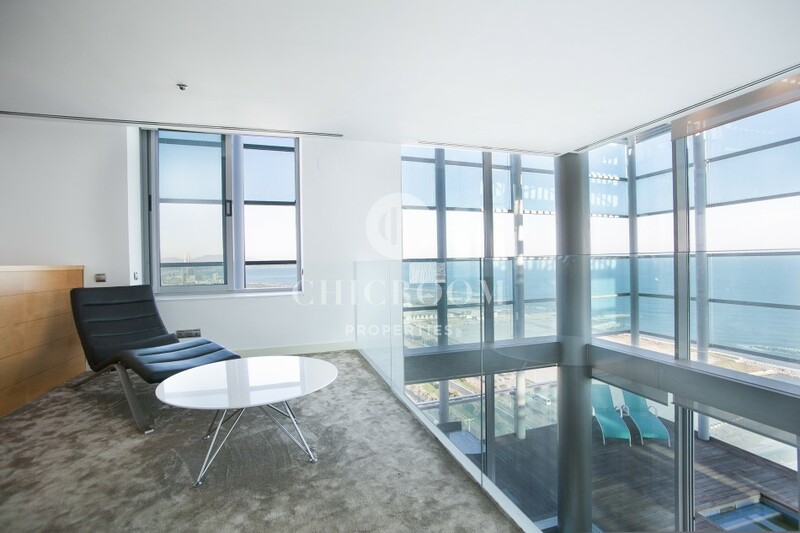 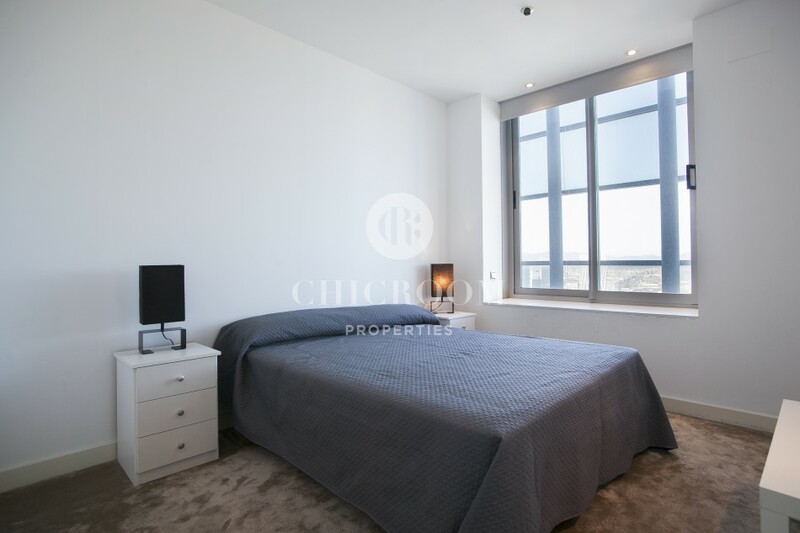 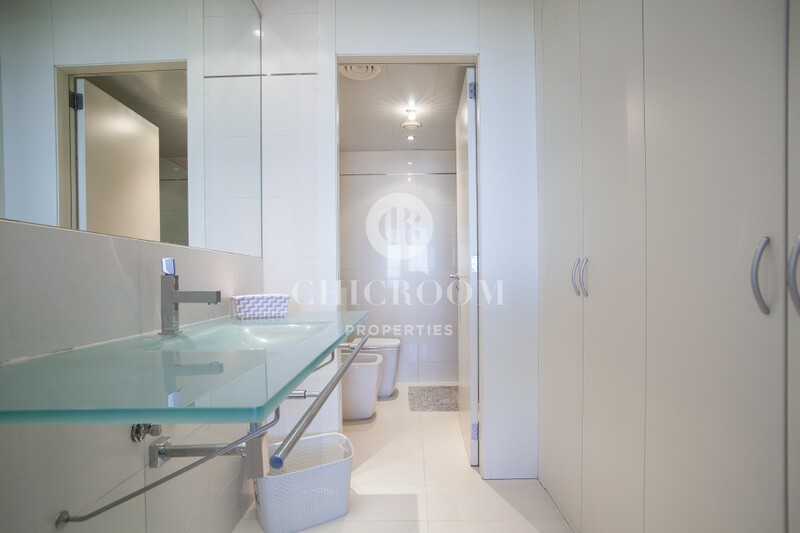 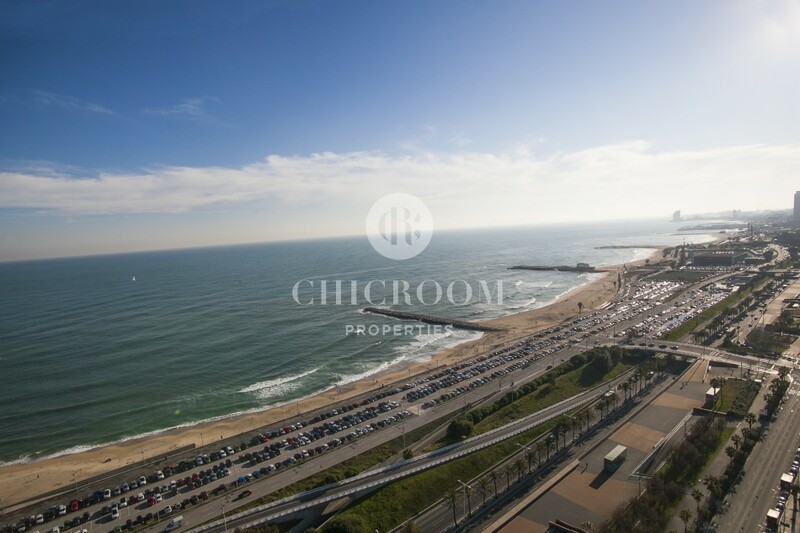 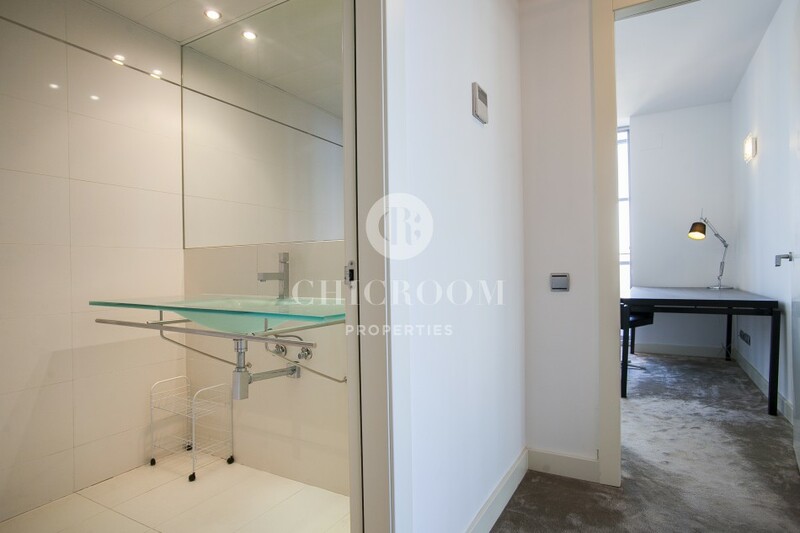 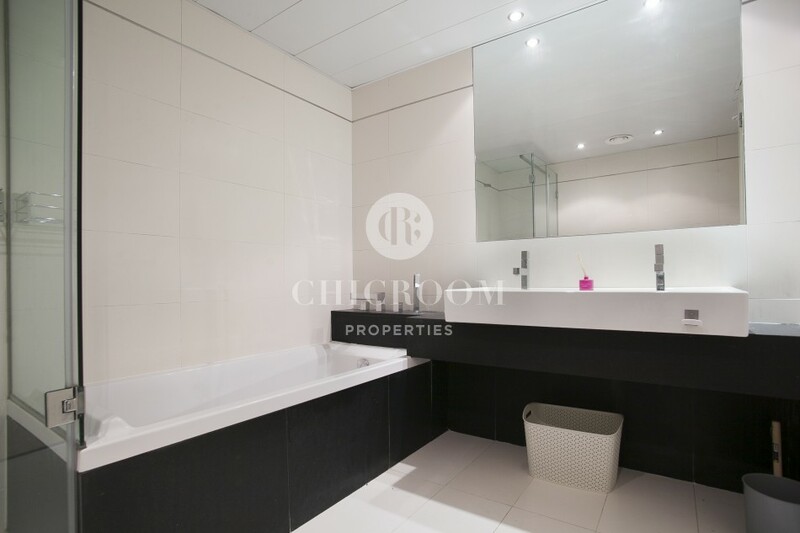 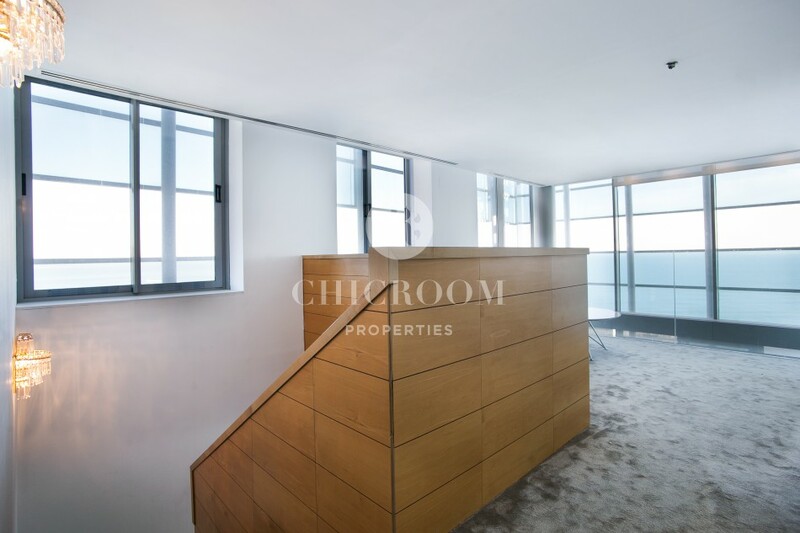 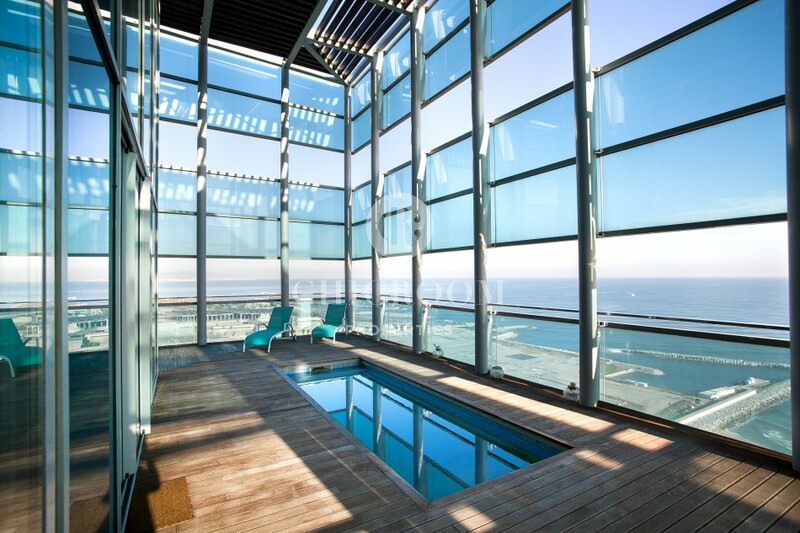 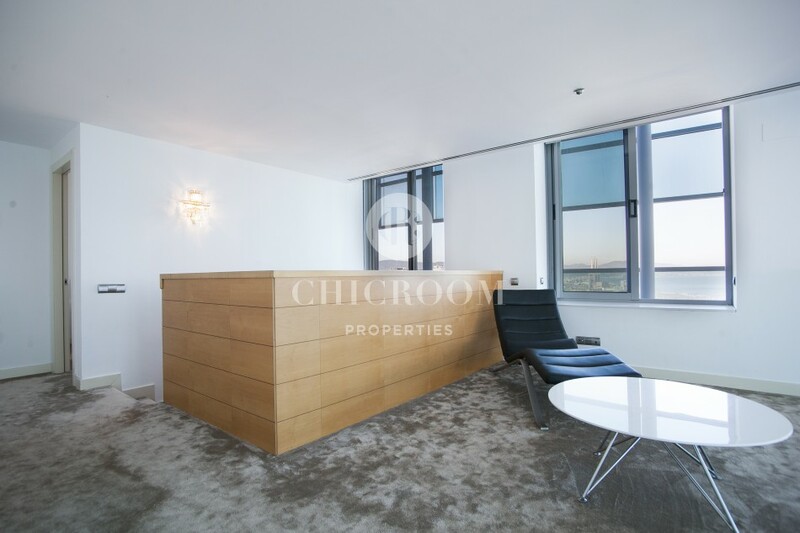 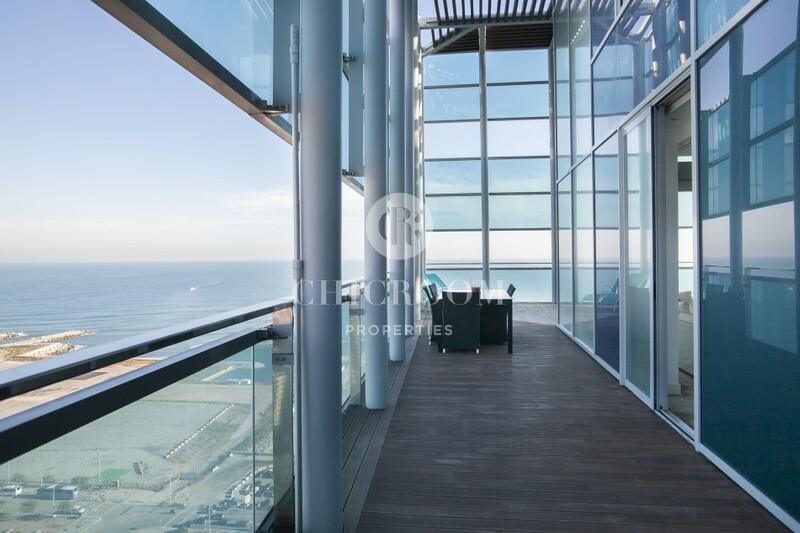 ChicRoom Properties is excited to propose you this incredible furnished penthouse duplex for rent in Diagonal Mar in Barcelona located in a modern and stylish building right by the seaside and in an exclusive neighbourhood. 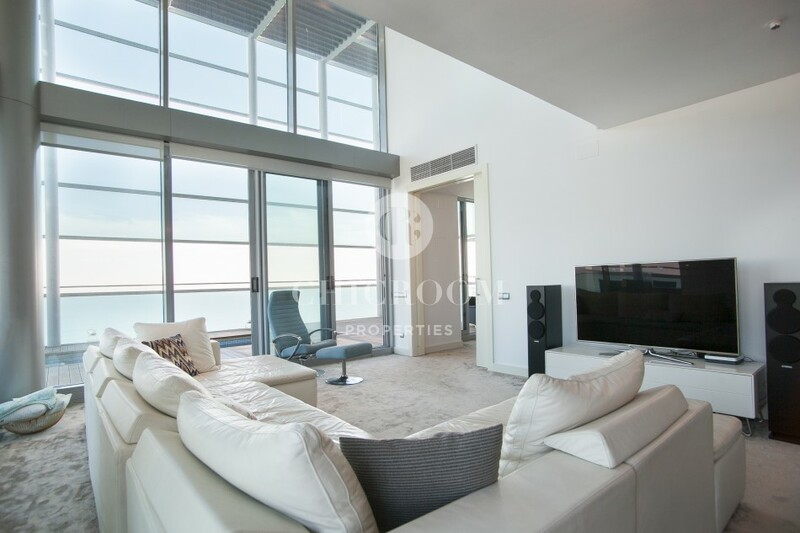 The 260-m2 property consists of a huge living space which contains a commodious living room with a TV area and a dining corner. 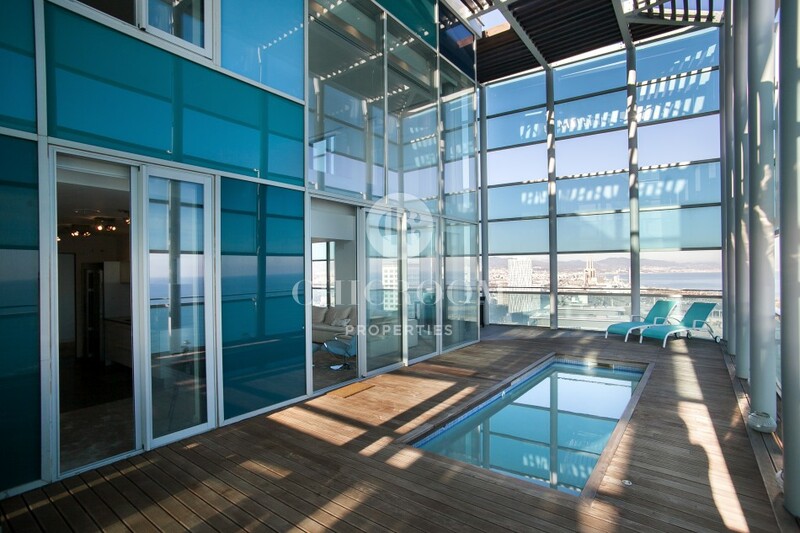 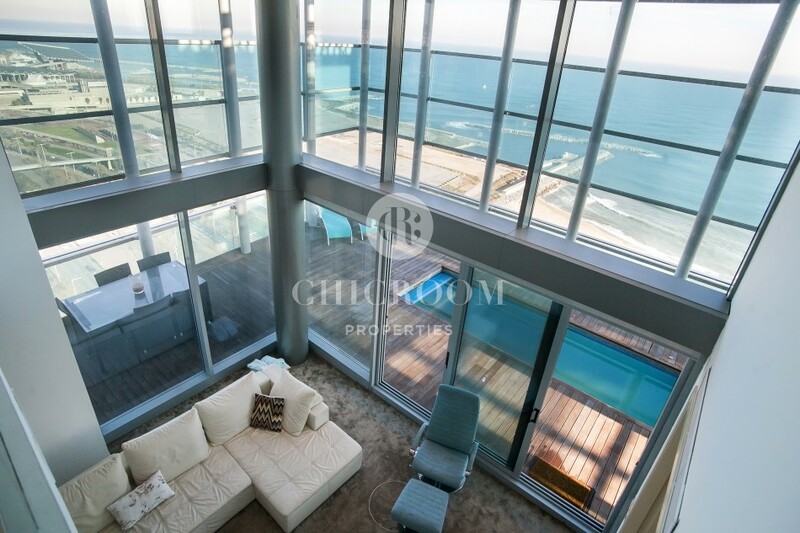 Massive bay windows with metallic structures offer fantastic views over the sea and give access to the large terrace. 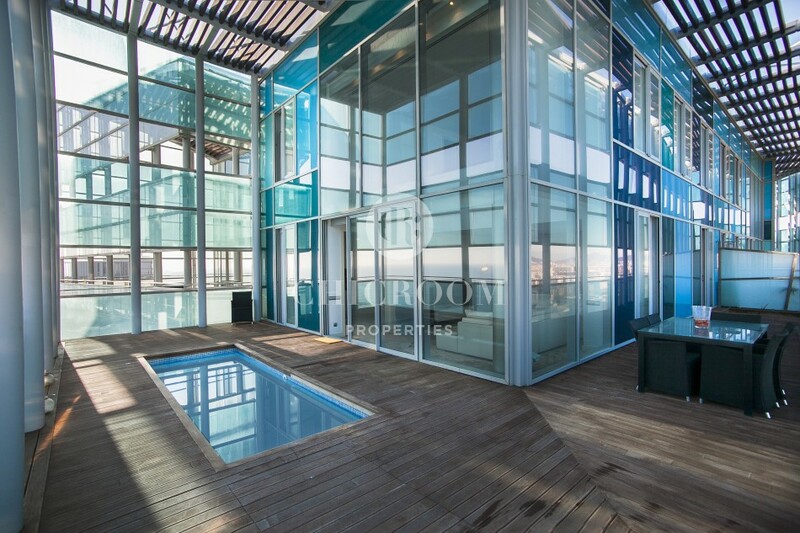 The deck is made of a beautiful wooden floor, has sufficient space for dining and relaxing and the best of everything is the private pool that would help you overcome the hot summer temperatures. 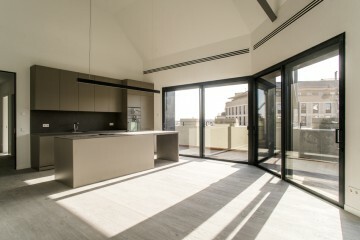 Sliding doors separate these two spaces from a fully equipped kitchen with some of the best household appliances and significant storages cabinets. 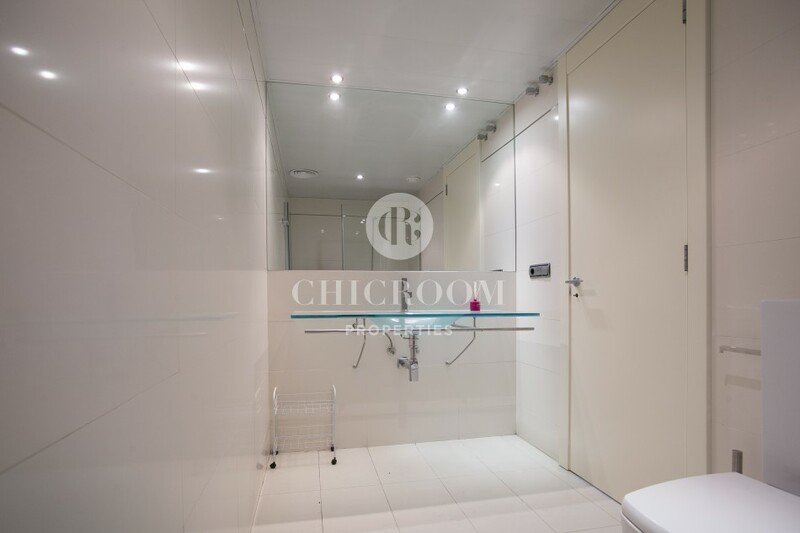 There is one bedroom located on the same floor that can be used as an office and it has a delicately tiled and complete bathroom nearby with a shower, a sink and a WC. 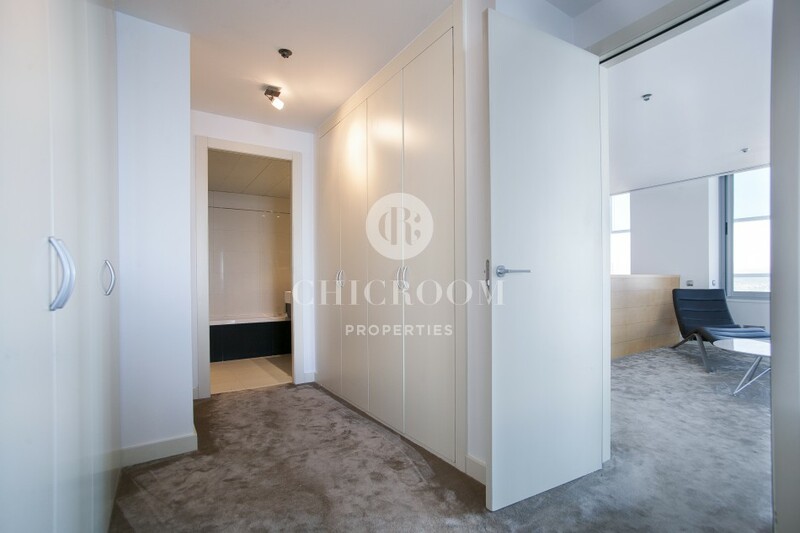 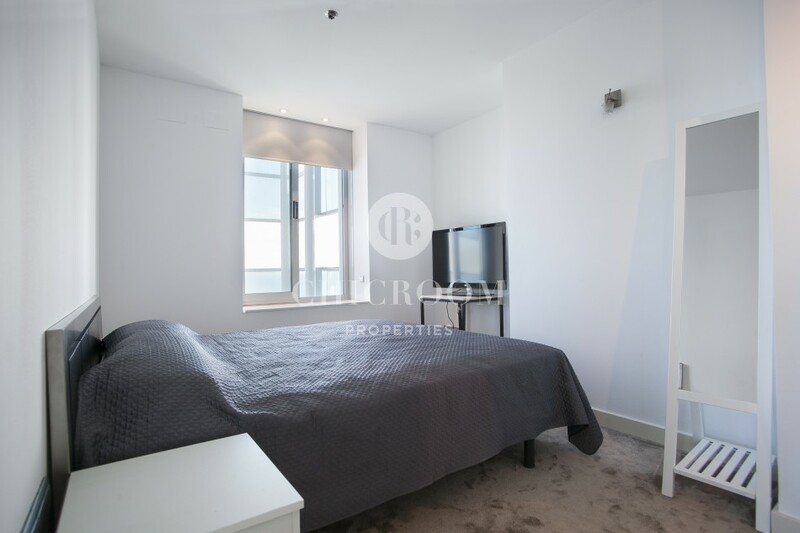 The other two double bedrooms are situated on the second floor and also have en-suite similar bathrooms for the comfort of every occupant as well as built-in wardrobes. 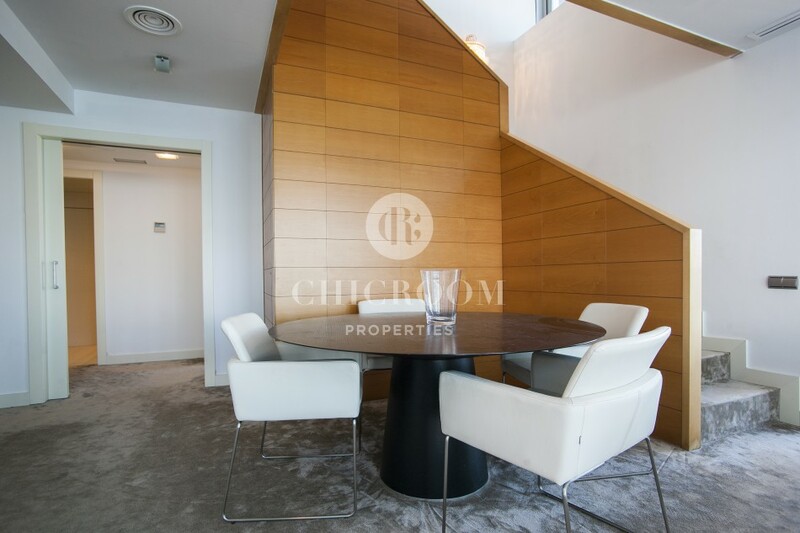 The small hall linking the upstairs rooms can be used as a small living room where you could chill out willing enjoying the same panorama as downstairs. 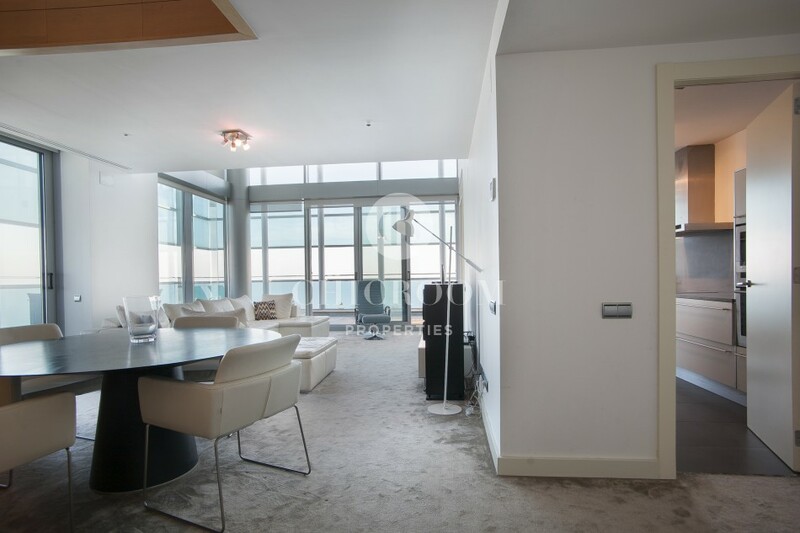 The decoration of this apartment is another great feature as it comes with design furniture in every room and most of the rooms have a warm carpet giving a welcoming touch to the dwelling. 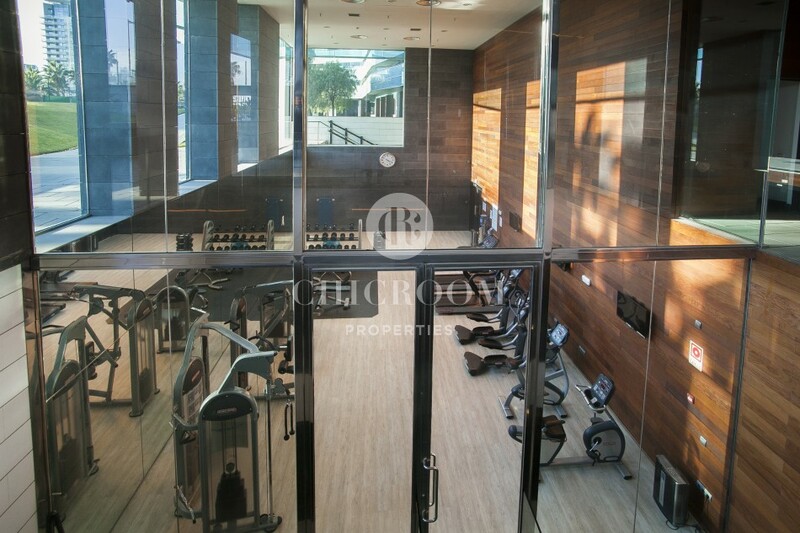 Parking spaces are available and the building has several communal areas such as a gym and gardens for instance. 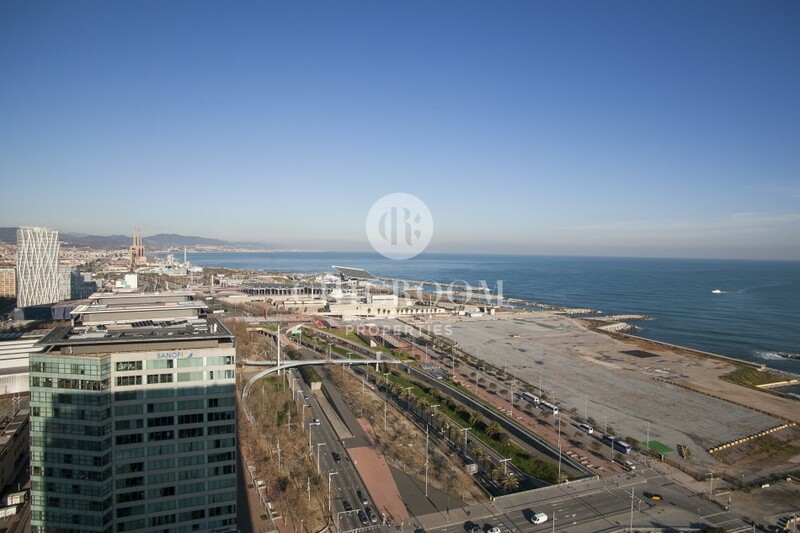 The neighbourhood of Diagonal Mar is very exclusive and has a great location. 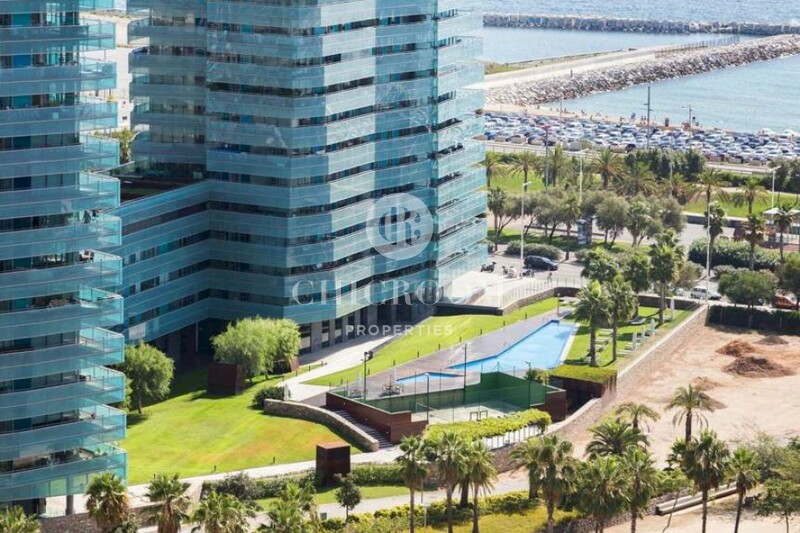 The beach is only a few metres away from the complex as well as Diagonal Mar shopping centre with its several shops and a supermarket. 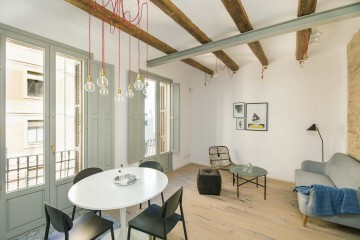 The trendy and artistic neighbourhood of Poblenou with its art workshops and bars is situated next door. 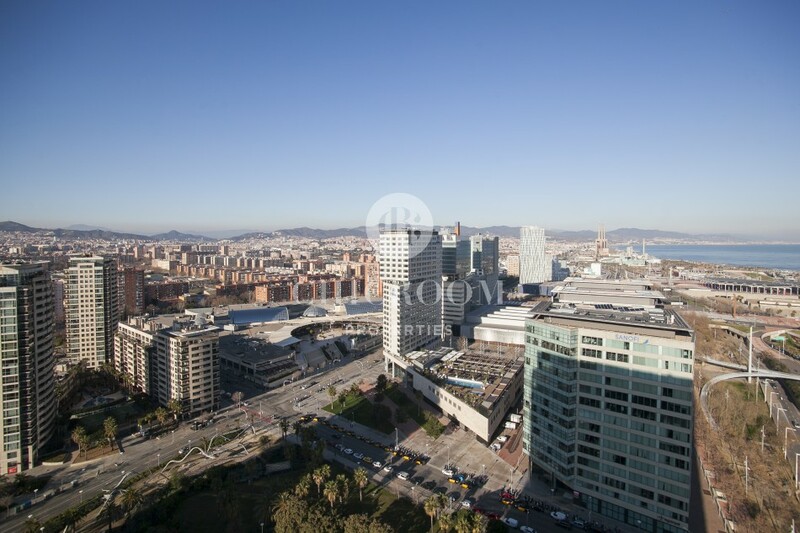 Thanks to some metro stations and bus stops, you could easily reach the city centre and any other part of the city. 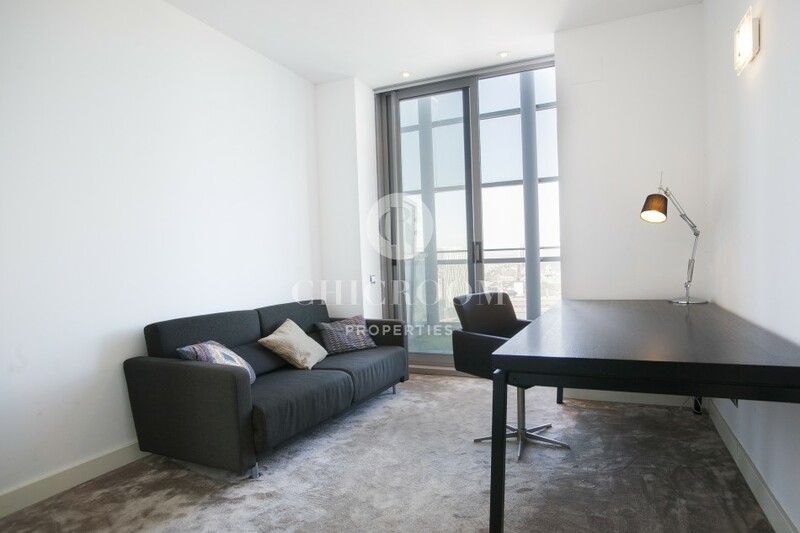 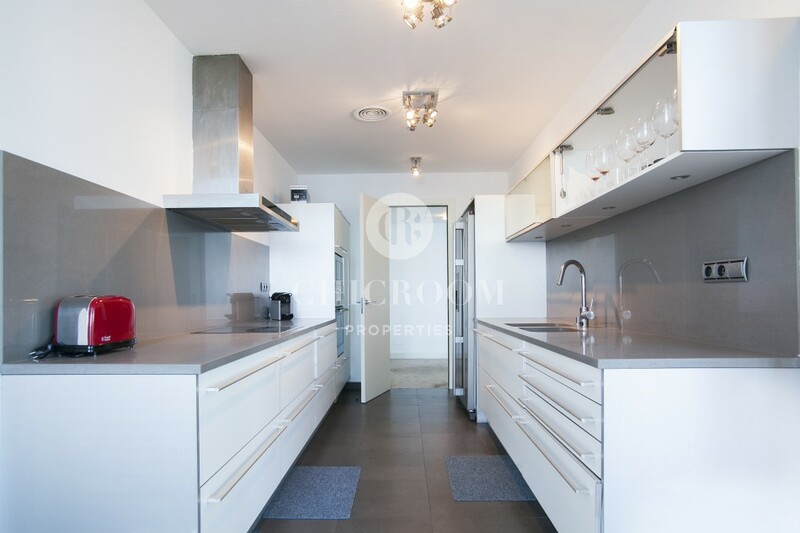 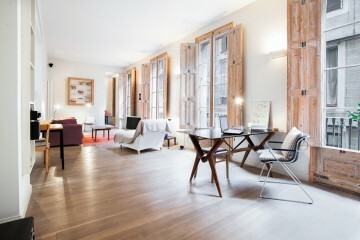 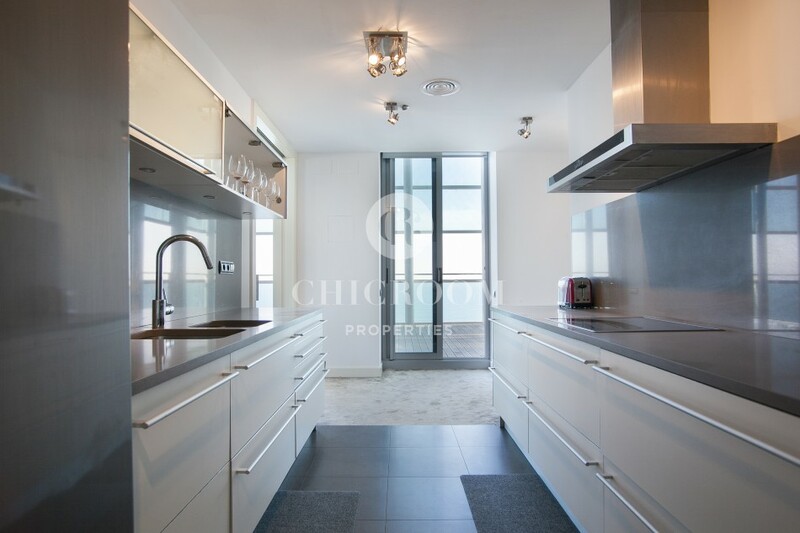 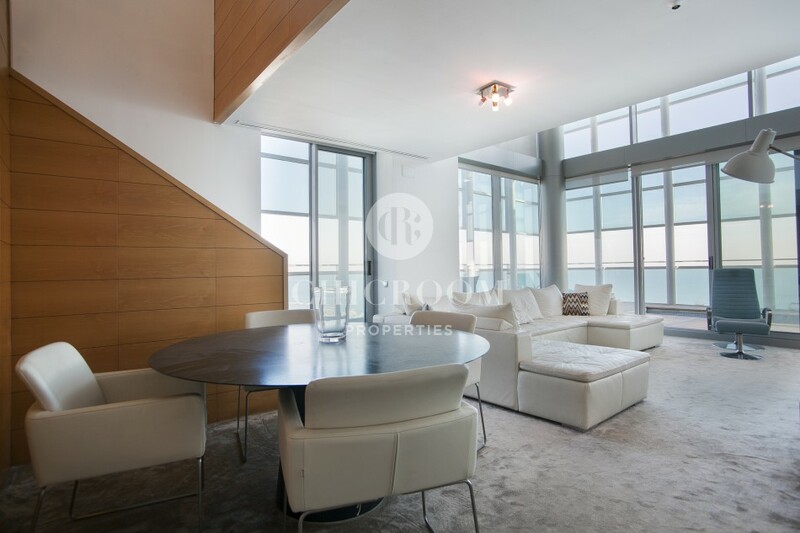 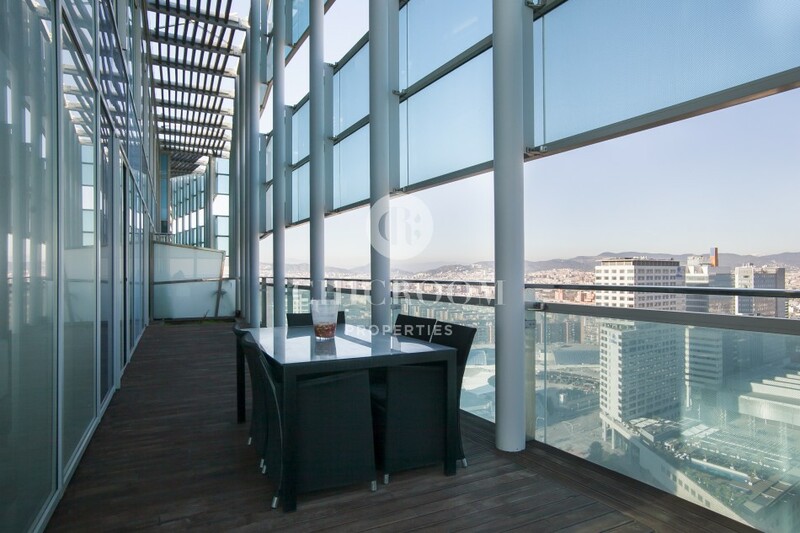 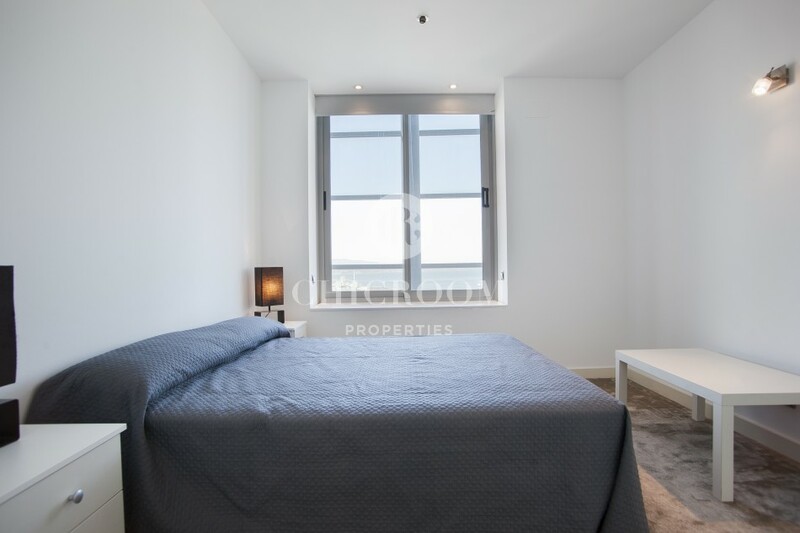 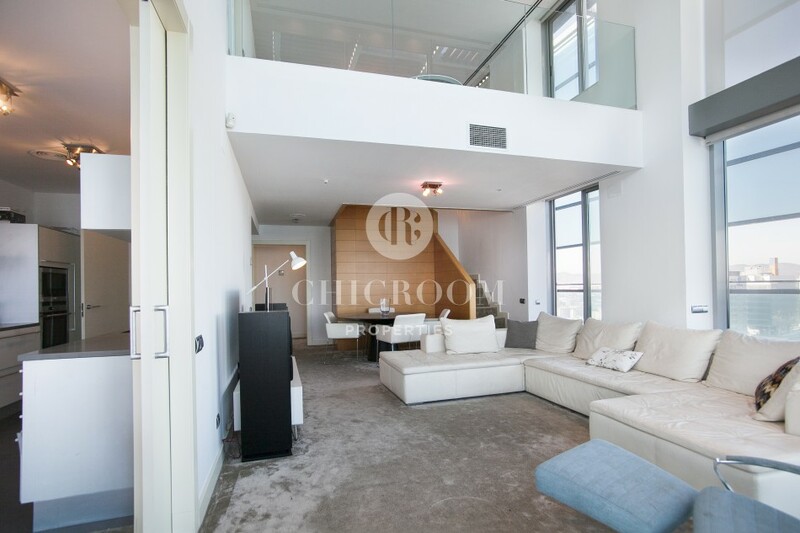 Do you feel like making this magnificent furnished penthouse duplex for rent in Diagonal Mar your new home? 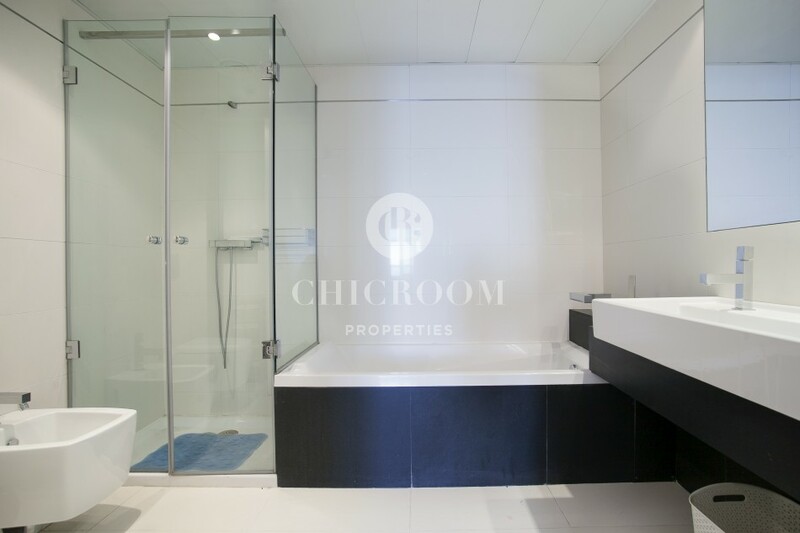 Contact us now for more information and we will organise a visit as soon as possible.